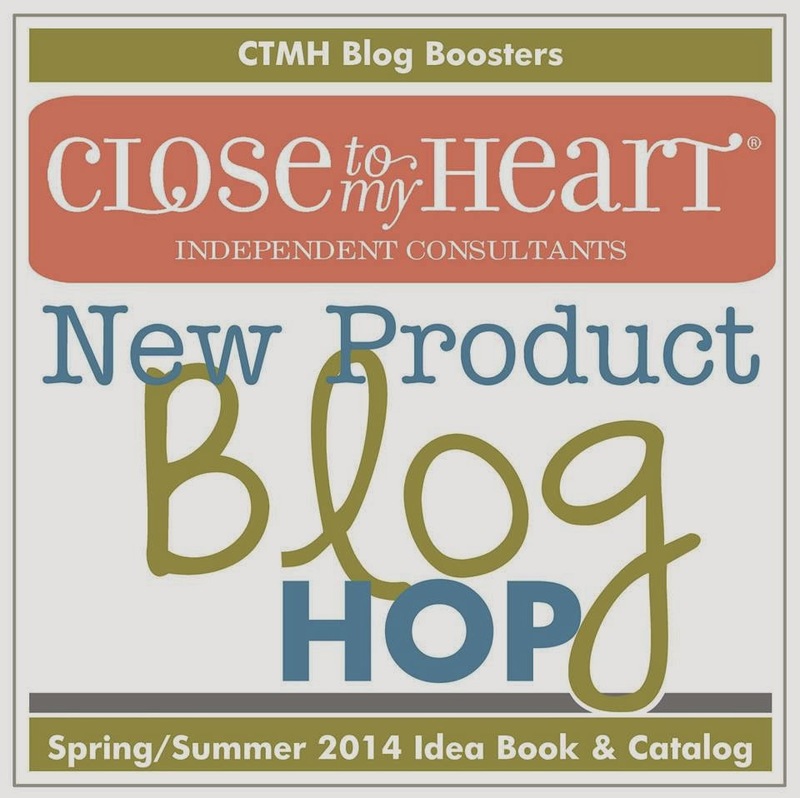 I am so excited to show you one of the new CTMH paper packets Lollydoodle!! It is so colorful and makes me HAPPY!! 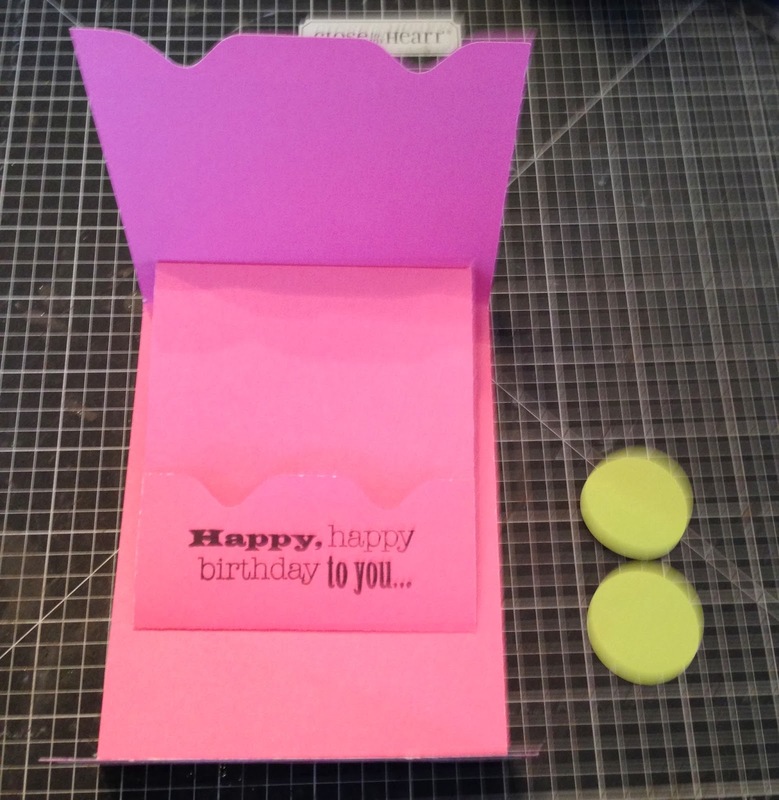 I made an interactive Gift Card Holder using Lollydoodle and my envelope punch board. The idea comes from Dawn stamping thoughts. I made a youtube video so you could get the full effect. Choose your base card stock. I went with Cotton Candy. 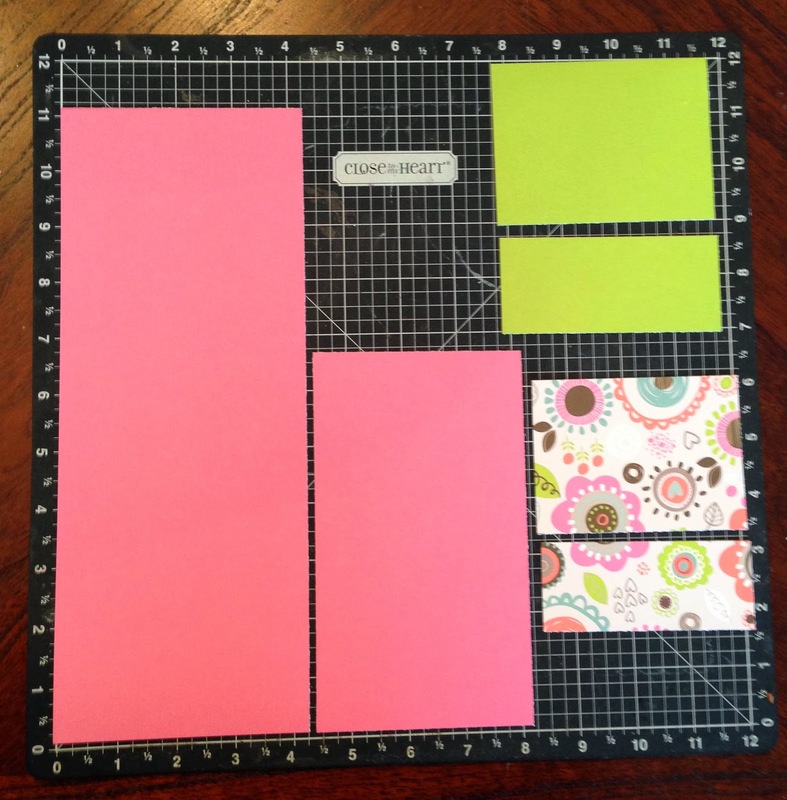 Cut the larger piece at 4 1/4 x 11 and smaller piece at 3 3/4 x 6 1/2. 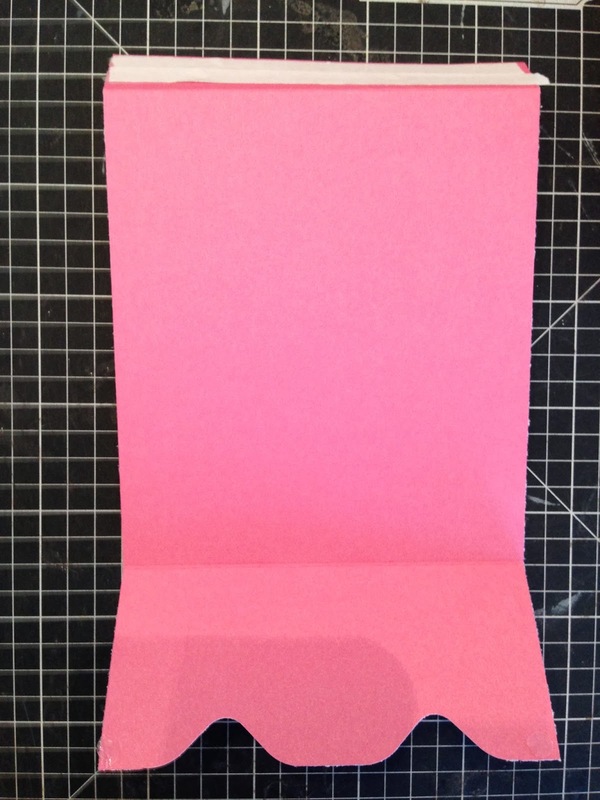 Choose another colored coordinating card stock. In this case I used Pear and cut the larger at 3 x 4 and smaller piece at 1 3/4 x 4. I decided what patterned paper I wanted to use and cut the larger piece at 2 3/4 x 3 3/4 and 1 1/2 x 3 3/4. 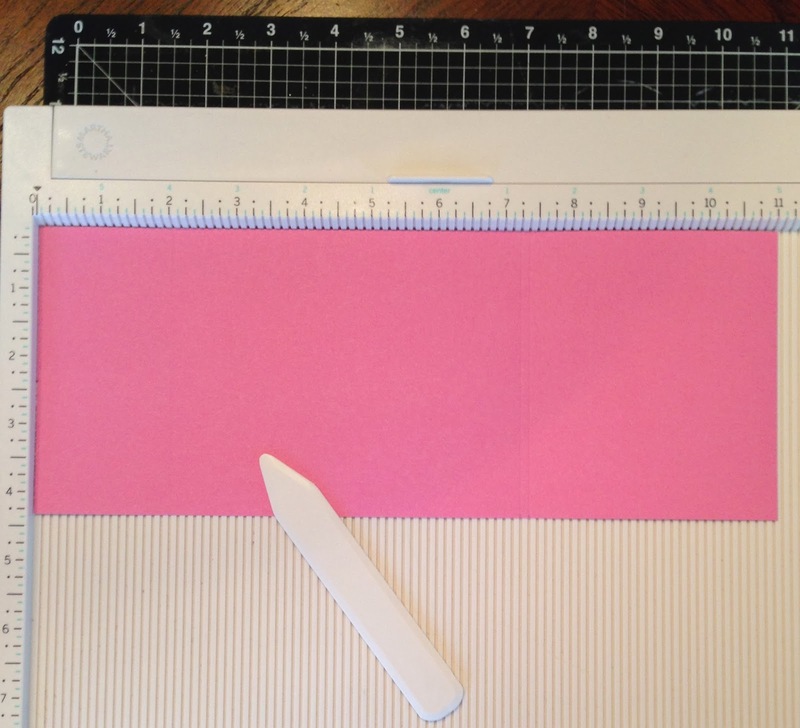 Score your larger piece at 2, 7 1/4 and 7 3/8 inches. Score the smaller piece at 1 3/4 and 6 inches. Fold along all the score lines. 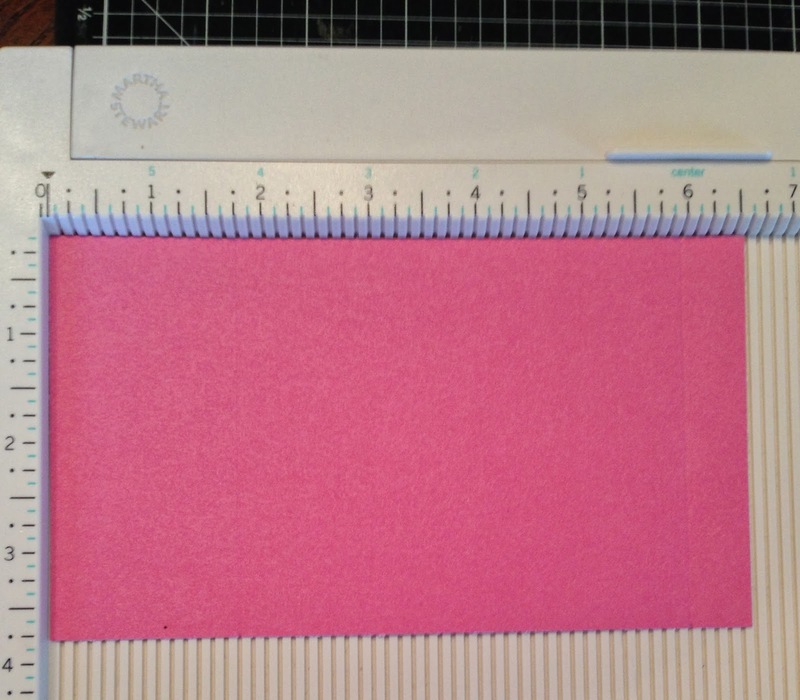 Take the larger base card stock and place the larger end on the envelope punch board at 1 inch and punch. Turn over the piece and do the same on the other side. 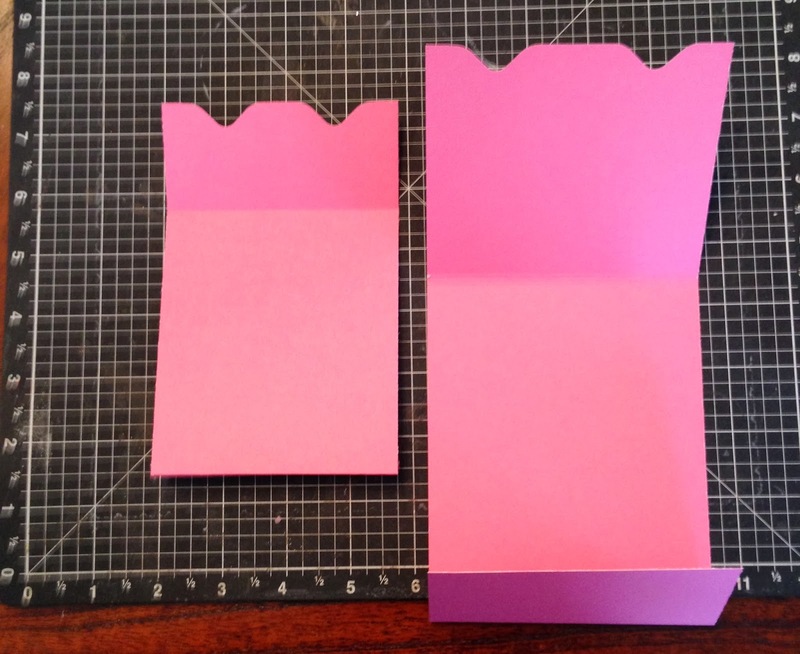 You will want to repeat this for the smaller piece of card stock on the larger end. It should look like the below picture. 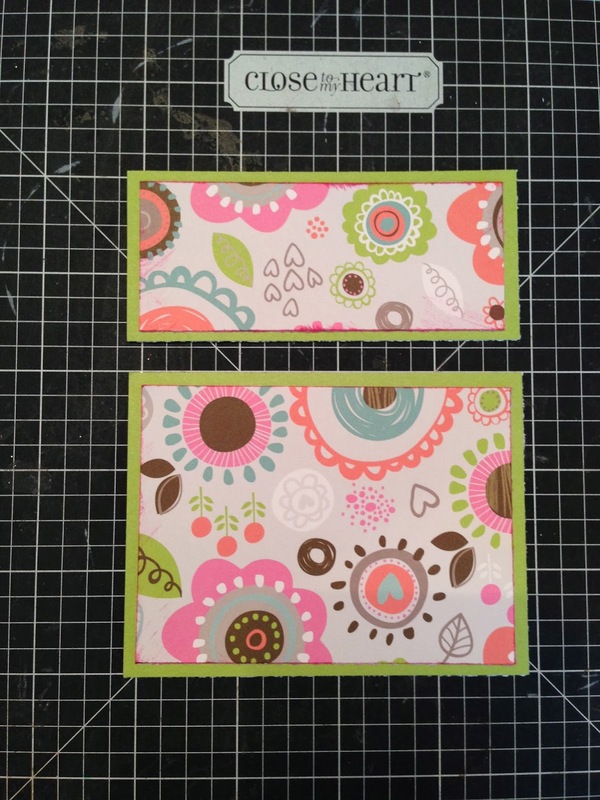 Go ahead and line attached your patterned pieces to the card stock. I distressed the edges of the patterned paper with Cotton Candy ink. Put double sided tap on the end of the smaller tab. 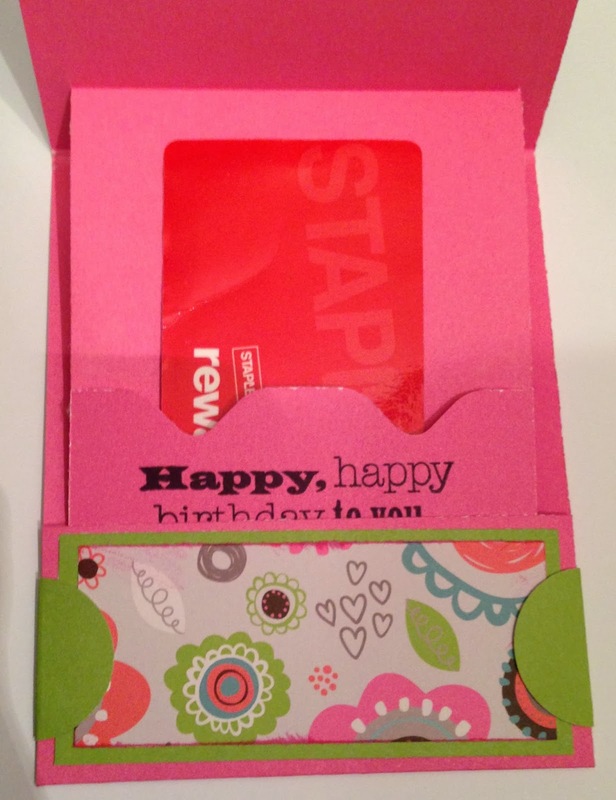 If you want to have a sentiment on the piece that pulls up holding the gift card stamp it now. I made the embellishment for the front panel used the Art Philosophy Cricut cart. I cut the frame using Perfect Fit Frame stamp set from pg at 2 1/4 inches. 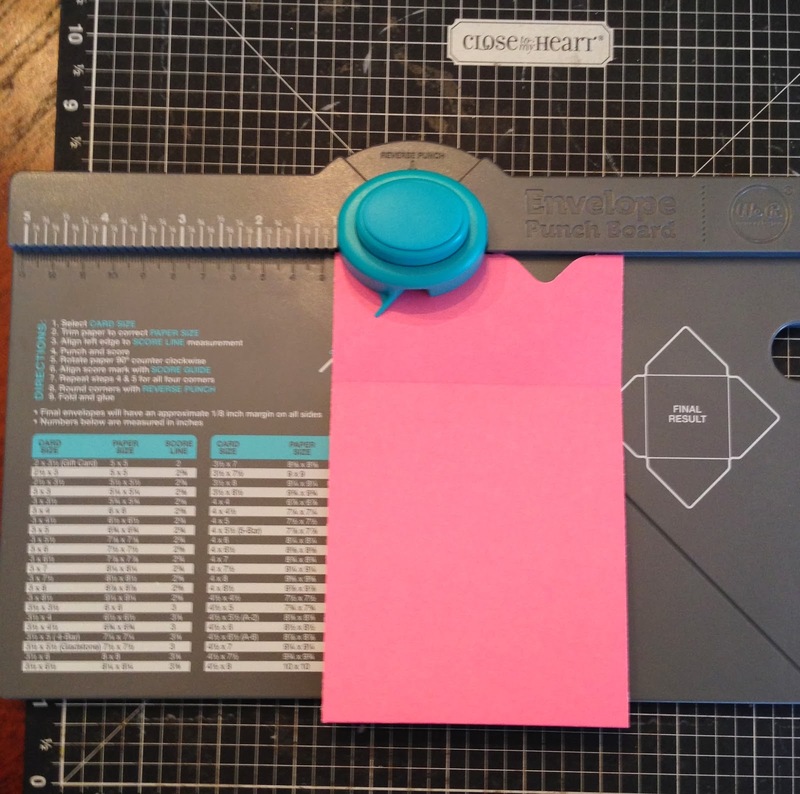 I cut a circle at 1 1/2 inches from pg. 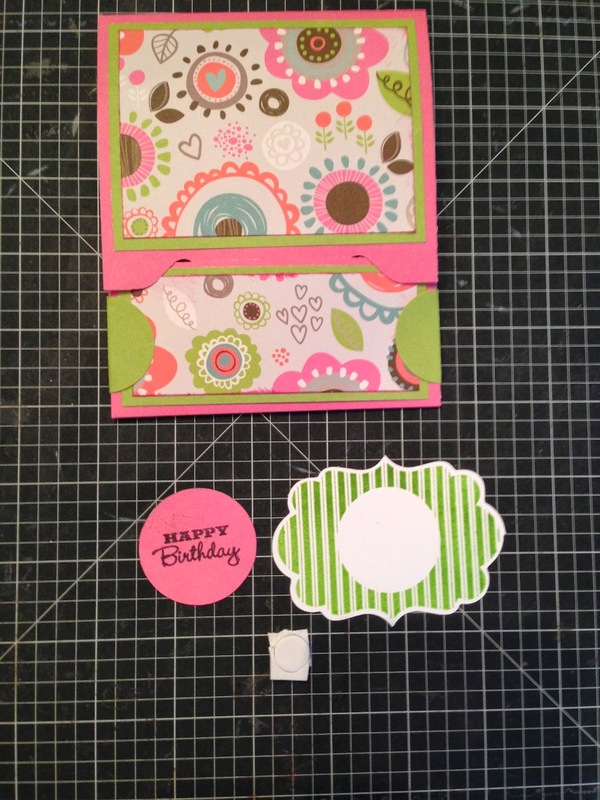 I stamped "Happy Birthday" using the Holiday Tags stamp set. 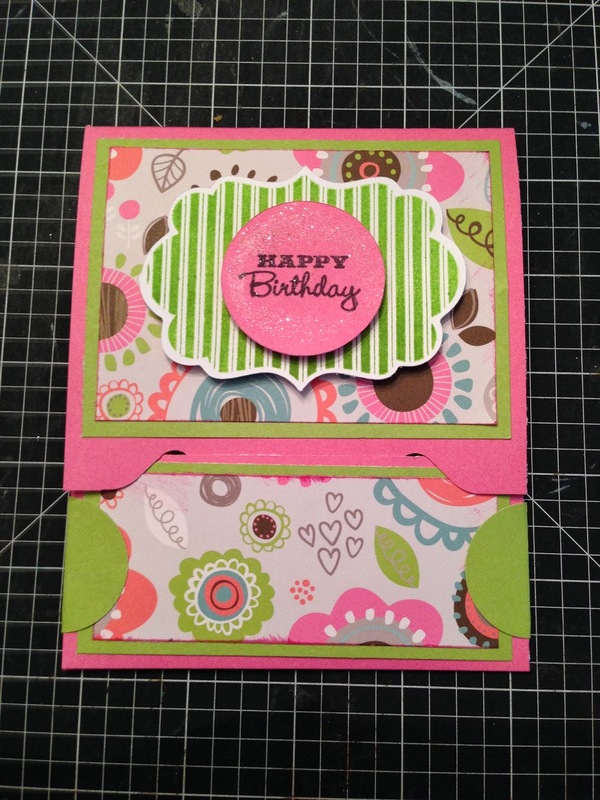 The inside sentiment is from the Card Chatter Birthday stamp set. I used 3-D foam on the back of the frame and then the circle. I added some glitter to the circle sentiment. I used cotton candy, black, pear and whisper ink. I love how they came out and I love that it is interactive. So much fun!! Thank you for stopping by and Happy Crafting!! Oh my goodness-- THANK YOU for the tutorial! I'm bookmarking this... and going to make a few! Fantastic work! Thank you Martha! It was so much fun to make. Enjoy! Very nice! Thanks for the great tutorial! Great project and love the tutorial. Awesome card! Love the tutorial!